Hippity hoppity, it’s that time of year! Easter is fast approaching and at Aspen Landing Shopping Centre, we have many stores that can help make your holiday eggscellent! Here’s a peek of just some of our stores located in our beautiful Southwest Calgary Centre that will make your guests look forward to Sunday! Every day, COBS Bread bakers create a range of traditional and gourmet breads baked from scratch and fresh in store daily. For a limited time only, try their hot cross buns made with your choice of traditional fruit, cranberry orange, or apple cinnamon for a hop in your step! Bring home and put out a custom curated basket of buns or a deliciously soft loaf for breakfasts! Bring the family to Color Me Mine the day before your egg hunt to create, fill, and paint your own eggs! Perfect for people of all ages, they offer a fun environment during the day and evenings promoting your creativity no matter your skill level. Bring some chocolate and make a beautiful egg or bunny to put it in! If you’re hosting this year, leave all the baking to Crave Cookies and Cupcakes. If you’re visiting this year, impress everyone with their Easter themed cupcakes or after dinner cake. With their endless number of confectionaries, you’ll be able to make everyone’s mouths water this Easter season. If you’d like to spruce up your place with lovely Easter lilies or bring your weekend hosts a nice gift, Flowers by Divine Creations is the place to visit! Head in and pick out a pre-arranged Easter bouquet or create a lovely arrangement of your own! The staff will be happy to help you with whatever your floral holiday needs will be. Those with a real sweet tooth this Easter would absolutely love the selection of ice cream at Marble Slab Creamery in Aspen Landing. 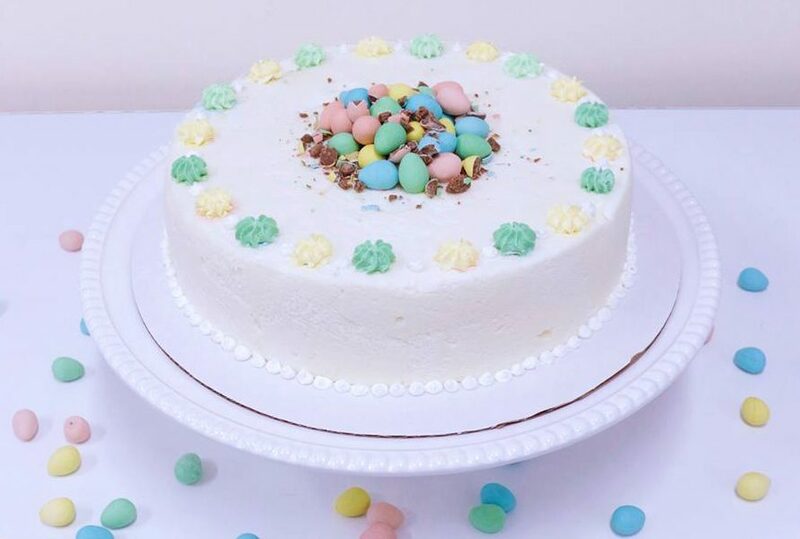 Being the first super premium ice cream shop to use a frozen slab for blending their ingredients into ice cream, Marble Slab will be happy to whip you up a cone, shake, or cake filled to the brim with wonderful Easter-themed goodies! Every little Easter egg searcher could use a fresh new pair of shoes or a hat to aid in their pursuit. Give your tyke the gift of a properly fit shoe that is custom fit to their unique shape and walk, enhancing proper growth. They have an inventory from newborn sizes to youth size 6 so you’ll be sure to find the perfect pair of kicks for your egg-hunting kids at Little Footprints! If you’re looking for an outing with the girls, head on over to Curious for a relaxing salon experience. With an incredible inventory of luxury beauty products for your hair, skin, and body, you’ll be sure to find that special weekend treat for yourself or others! Or, you can just get yourself that perfect Easter weekend do!